I am Rebecca Louiza Blackhurst, a person with many variables. . . . I have, in this life, had several incarnations, from dancer and astrobiologist to soap maker and writer. I really don't have enough time to do all the things that I want to do . . . however I think I am fortunate enough to have been able to have a go at most of my aspirations. There has been one constant though . . . and that has been writing. A little wild imagination as a child has grown into a bigger wilder imagination as an adult. Not wanting to lose the magic that we all have in childhood, I have grown into a dreamer and not having been able to fulfil some of my aspirations in this life, i.e. being a fighter pilot, astronaut, master jouster and wolf, to name a few, I have nurtured a secret inner life in which all these things are possible. I scribbled down many stories as a child and some are even memorable (to my parents at least). "The scruffy loin" (lion spelt incorrectly) was a particular favourite. People who have known me through my life, so far, and my many incarnations, have always known about the books; the ones I was writing, the ones that never got finished . . . . The birth of "the wolves of Solomon"
of New Zealand. It was here that I began to write the first novel that I was determined to finish. Loving wolves and hating the way they are persecuted, I brought two of my passions together . . . knights and werewolves. I had always been interested in the Knights Templar. These enigmatic knights were a force to be reckoned with and they were supposed to have a big secret . . . . in my mind they had to be supernatural, and so thus was born "the wolves of Solomon." My werewolves had to be different from those of most people's nightmares and I wanted to turn them into the heros (though there are baddies amongst them). They do exist . . . in my imagination, and I have strived to make them believable . . . . and perhaps, just perhaps they are out there . . . Still on my fantasy streak, I have just begun to write children's stories. Last year I started a series of books called "The Adventures of Count Grumpula." Early this year, I teamed up with fantastic artist, Rachael Errington, and we began to put the first Grumpula book together. 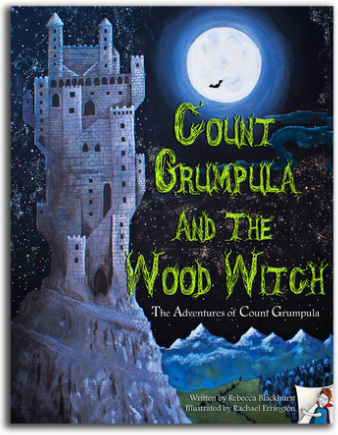 "Count Grumpula and the Wood Witch" is due for release on the 20th of June!! Rachael and I are very excited about our new book and have set up a small publishing company, Cobble Creep Creations, which will deal with the forthcoming Grumpula series of books, beautiful prints and artworks from the books and other wonderful creations. Check out our magic HQ!